Our proprietary two-part preliminary cleaning procedure is key to our high purity products. 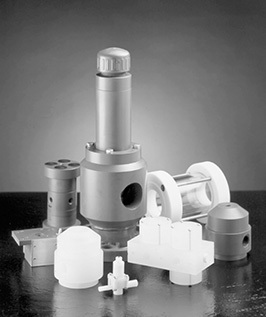 Plast-O-Matic provides a complete line of standard and custom designed solutions for difficult applications. » Click on product for more information. 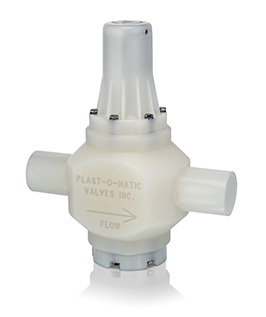 As the performance leader in the development of plastic valves and controls, Plast-O-Matic provides a complete line of standard and custom designed solutions for difficult applications. The corrosive liquid markets use Plast-O-Matic products for the control of sodium hypochlorite, nitric acid, hydrochloric acid, phosphoric acid, sulfuric acid, solvents, chlorine, hydrogen peroxide, ethylene glycol, seawater, detergents, surfactants, brine, oil, fluoride, ferric chloride, sodium bi-sulfate, ferric sulfate, and calcium chloride. Actuated & Manual Ball Valves feature trunnion safety design and dual sliding seats for ultra-smooth operation and repeatable bubble-tight shutoff with an incredibly long cycle life. 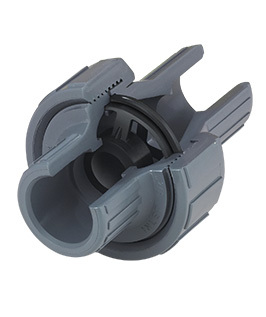 Available 2-way and 3-way, in 3/8"– 4" sizes. 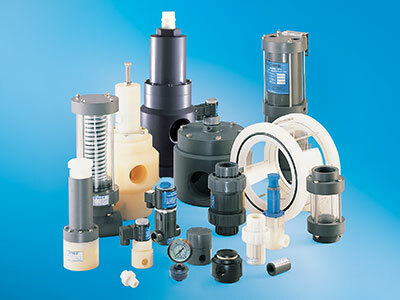 Leak-proof check valves prevent reverse flow of water, extremely corrosive, and ultra-pure liquids. 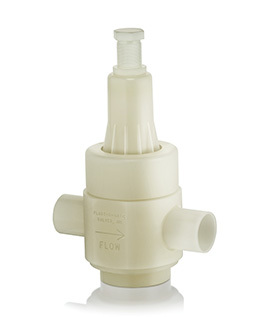 A unique, patented diaphragm provides normally-closed operation with a bubble-tight seal, even with no reverse pressure. An encapsulated spring and sliding poppet recreates this performance in larger sizes. ½" through 4" sizes. 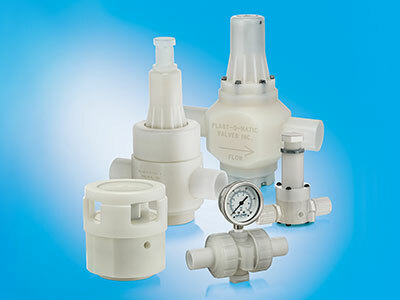 Choice of PTFE or Viton barrier seal protects instruments from corrosion and clogging while maintaining high accuracy. Compact and ultra-pure zero dead leg designs available. 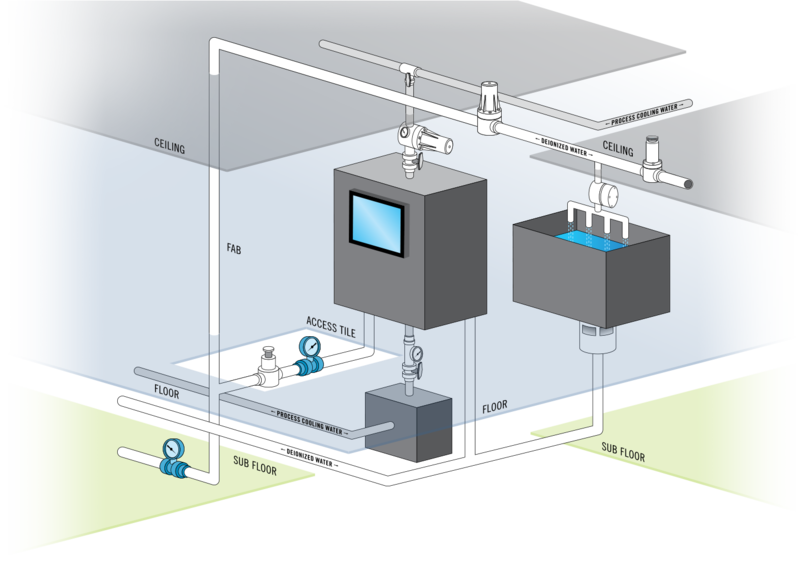 Flow, level, and pressure switches signal equipment as system parameters change. 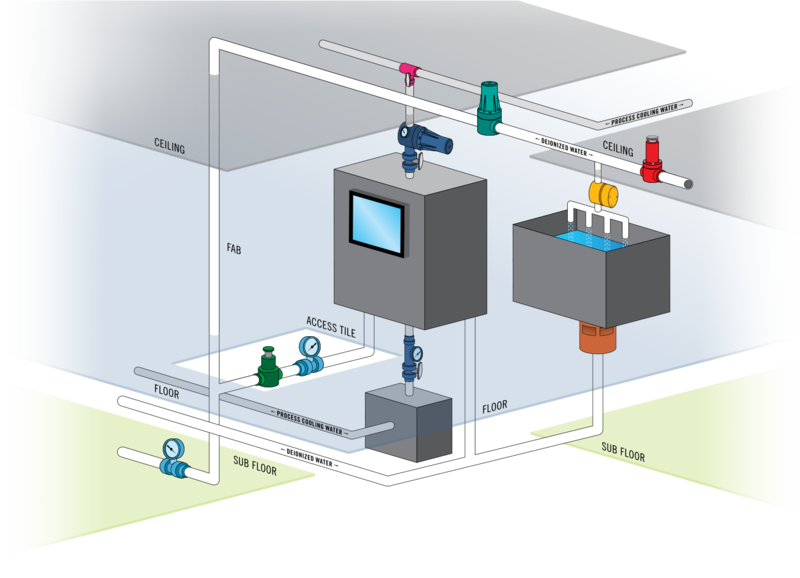 Differential pressure gauges, variable area flow meters and fluid presence sensors indicate system changes at a glance. Plast-O-Matic instruments are designed with isolated or coated metals to prevent corrosion and process contamination. Accurately reduce and regulate steady or varying inlet pressures and maintain a constant, predetermined maximum outlet set pressure. 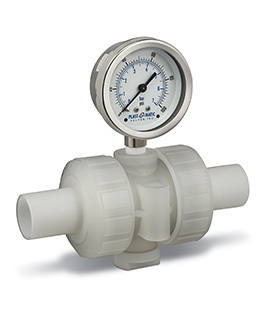 Offered in spring controlled, air controlled, differential controlled and ultra-pure designs, Plast-O-Matic regulators are consistently recognized as the industry’s top performers for maximum flow with minimal drop-off from set pressure. ½" through 4" sizes. 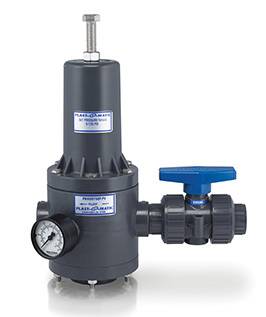 Prevent system overpressure, regulate backpressure, provide automatic bypass, and eliminate siphon with high performance relief valves. 2-way and 3-way designs, straight and angle pattern, choice of elastomer or PTFE diaphragm design. ¼" – 3" sizes. 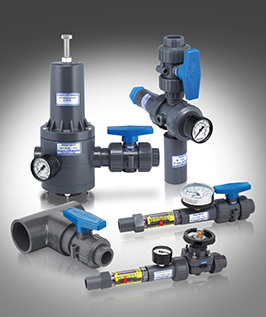 Variety of air operated, line pressure assisted, and manually operated shut-off valves in both diaphragm and globe styles. 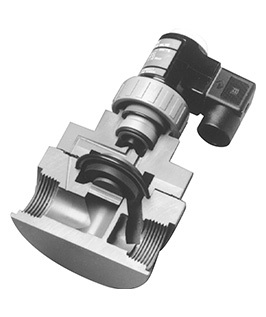 Air operated pinch valves, quick dump valves, and three-way valves also provide bubble-tight shut-off for a variety of applications. 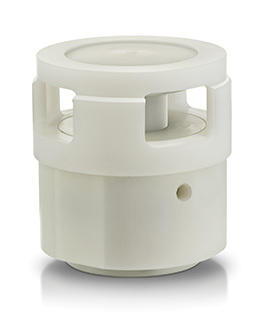 Available in compact and heavy duty designs with a number of options including fail-safe spring return, limit stops, visual indicator windows, and the patented Fail-Dry® early warning vent. For safe, positive indication of flow and clarity of corrosive or ultra-pure liquids. 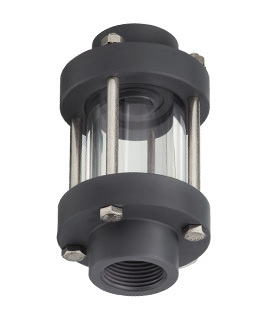 Single-wall design for liquids compatible with acrylic; double-wall design features Pyrex inner cylinder for all other applications. Optional streamers provide instant visual proof of flow. ½" to 8" sizes. 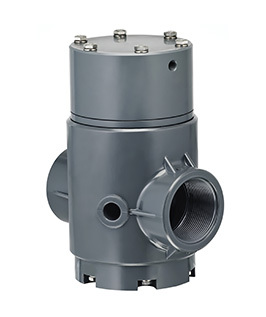 Electrically actuated valves for severe service applications for virtually all types of solutions. PTFE bellows barrier seal in both direct acting and pilot operated designs; proven million-cycle life provides lowest cost of lifetime ownership. Normally-open and three-way models available. ¼" through 3" sizes. 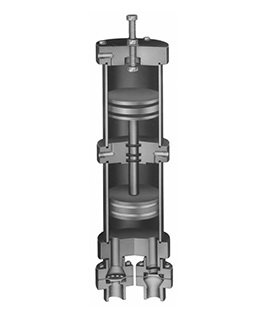 Air release valves provide high capacity venting of gas at system start up, while degassing valves vent trace amounts of gas as it occurs during system operation. Vacuum breakers open automatically in response to minimal vacuum to prevent unwanted siphonage or collapse of storage tanks. 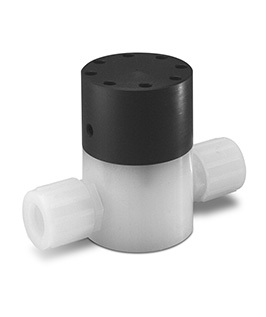 Plast-O-Matic degassing vent & vacuum breaker valves automatically seal bubble tight when not in use; air release valves automatically reseal when liquid fills the valve. Air Operated Filling/Metering Pumps for precise filling, dosing, dispensing of ultra-pure liquids and corrosive chemicals. For unique or unusual applications, be it size, flow, pressure, function, or purpose, Plast-O-Matic has the engineering and lean manufacturing capability to provide custom solutions as you need them. 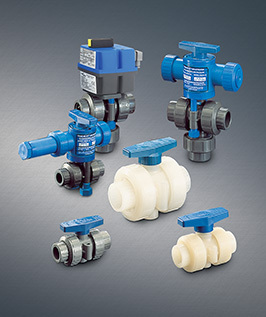 From minor modifications to completely new designs, Plast-O-Matic has created more one-of-a-kind corrosion resistant and ultra-pure valves and controls than any other manufacturer. Contact your distributor, regional representative or our Technical team in Cedar Grove NJ to discuss your needs. 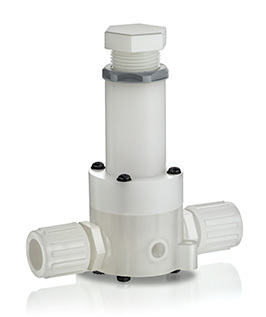 Ultimate combination of flow performance and purity; features machined Kynar 740 body with metal ion-free EPDM elastomer and non-rising adjustment. Includes choice of spigot types and proprietary POM pre-assembly cleaning, 8 hour cold/hot rinse, and final Class 100 clean and double-bag procedure. Design also closes bubble tight in the event of severe overpressure. 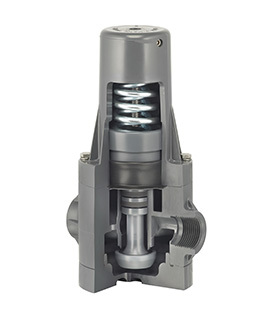 Cleanest pressure regulator on the market features convoluted TFM diaphragm and no external fasteners and is designed to meet SEMI F-57 specifications. Includes choice of spigot types and proprietary POM pre-assembly cleaning, 8 hour cold/hot rinse, and final Class 100 clean and double-bag procedure. Non-closing design for continuous flow systems. Unique in-line design eliminates dead leg that can harbor bacterial growth and contamination. Unpigmented thermoplastic material. Special flexible elastomer spool separates system liquid from gauge fill liquid and assures accurate reading; choice of FKM or metal ion-free EPDM. 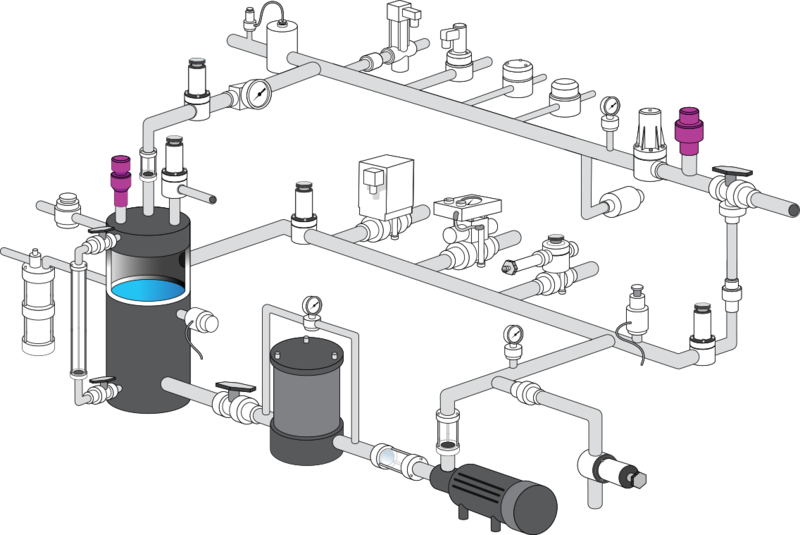 Choice of spigot types; available with or without gauge. Drain mounted for rapid vortex emptying of a sink or tank. 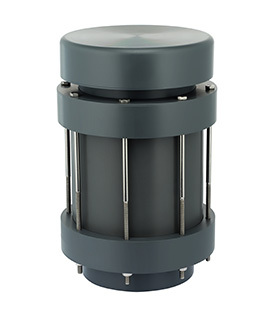 IDA is available as double-acting air by air or normally-closed spring return design. 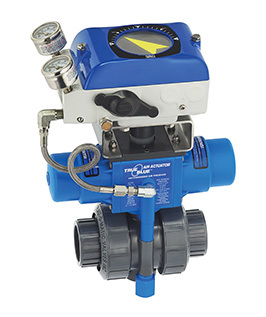 High capacity design provides up to twice the flow rate of typical dump valves; remains bubble-tight with up to 25" of head. Long cycle life and compact design: Air to open/spring return normally closed. Excellent for delivering water, ultra-high purity or highly corrosive liquids to spray heads and other points of use. PTFE diaphragm with no wetted elastomers plus smooth internal cavities preserve purity and avoid deadleg. Connections can be female socket, female threads, spigots, or flare. PTFE diaphragm provides the ultimate in corrosion resistance and contamination free sealing with no wetted elastomers. Versatile valve functions as backpressure regulator, pump backpressure, bypass, relief, or anti-siphon valve. For water, highly aggressive and ultra-pure liquid applications. 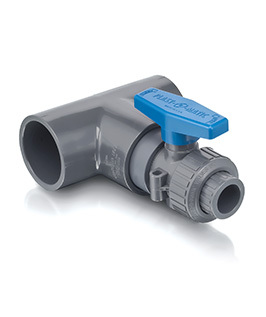 Revolutionary ball valve adapter eliminates weakness inherent to lateral drops; installs easily into the tee without additional fittings. Also an ideal replacement for costly zero dead-leg valves. Rugged, reinforced assemblies for process cooling water applications combine valves, gauges, flow meters and connectors into compact “sticks” that are virtually indestructible and drastically reduce installation costs. 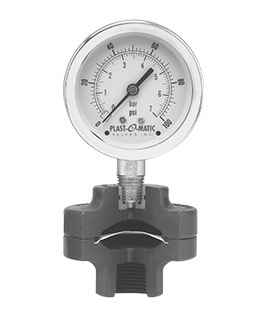 PCWS supply side features pressure regulator and pressure gauge; PCWR return side features flowmeter and throttling valve. Customizable with any combination of valves and connections. Eliminates poor flow performance and rouging inherent with stainless steel products. Water/Wastewater Treatment systems rely on Plast-O-Matic products for pump protection and system efficiency, chemical injection, exacting pressure and flow control, air release, degassing and vacuum venting, pulsation dampening, and anti-siphon protection. 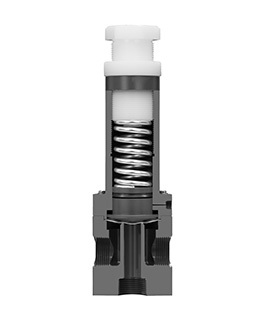 Plast-O-Matic Valves are designed for the ultimate performance in purity, corrosion resistance, reliability and longevity…four critical factors in any water/wastewater treatment system.